Public places such as offices and gyms are becoming increasingly intolerant of products with strong scents, like perfume. This is because these is more and more evidence that the chemicals used to give these products a nice smell are actually toxic. Although respiratory toxicity is often linked to harsh smelling cleaning products, sweet smelling perfume also has its fair share of harmful ingredients. While perfumes were traditionally made with flowers, herbs and animal fat, the mid 20th century saw the beginning of the use of synthetic chemicals in these products. Why? Because it was cheaper to make. Today, nearly every perfume on the market are 95-100% synthetic (1). Nearly 3,000 chemicals are used to create fragrance. 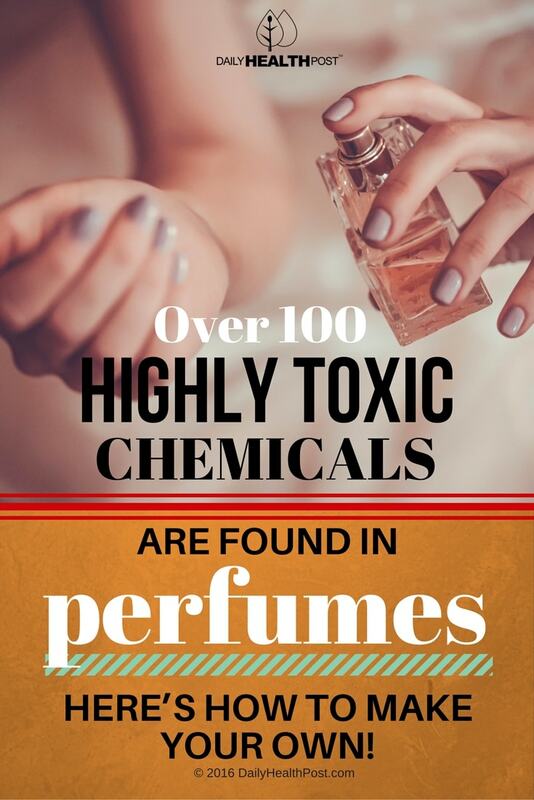 And these chemicals aren’t just in perfume: they often hide in colognes, deodorants, personal hygiene products, cosmetics and cleaning products. Even products labeled “fragrance-free” and “unscented”contain fragrance along with a masking agent to prevent your brain from detecting odor (2). While 900 of these products are know to be toxic, a larger number of the chemicals have unknown health effect and have never been tested for toxicity, alone or in combination (3). And while toxic substances are often associated with lower quality products, they have always been found in designer products. Scientific American reports that the Campaign for Safe Cosmetics, a coalition of over 100 groups seeking transparency about chemicals in cosmetics, commissioned independent laboratory tests that revealed a shocking truth: 17 of the country’s top-selling perfumes contained on average 38 secret chemicals known to accumulate in human tissue and cause serious health conditions. And these are not isolated cases, the Environmental Health Network of California received complaints of respiratory and neurological symptoms after the use of Calvin Klein’s Eternity perfume (4). 5 ingredients that are “Skin sensitizers,” or allergens. Common offenders to look out for include: Diethyl phthalate, Dibutyl phthalate, Ethylene Oxide, Nitrosamines, Benzophenone, Parabens, Butylated hydroxyanisole (BHA), Galaxolide, Musk xylene, Musk ketone, Octinoxate, Tonalide, Styrene (5). These chemical often don’t appear on the label. Instead they are bundled up as one ingredient: fragrance. This makes it almost impossible for consumers to know what’s really in their favorite products. Unlisted ingredients in “fragrance” are known to irritate the respiratory system and skin. In sensitive individuals, they can trigger allergies, migraines, and asthma symptoms. It’s been discovered that approximately 95% of chemicals used in fragrances are synthetic compounds derived from petroleum. These kinds of chemical compounds are directly linked to neurological problems, poor immunity, autoimmune disorders, dermatitis, respiratory distress, asthma, eye irritation, cancer, allergies, infertility, miscarriage, and child behavior disorders including learning disabilities, mental retardation, hyperactivity and ADD. Some of these chemicals are used in septic tank cleaners and pesticides and have been, alarmingly, found in human breastmilk. How Are These Chemicals Allowed? The FDA doesn’t require cosmetic companies to list all the ingredients that go into making their product smell good. In fact, the chemicals can simply be grouped together under the label of “fragrance” because these ingredients are considered trade secrets. This is thanks to the Federal Fair Packaging and Labeling Act of 1973. For the most part, the perfume industry is mostly self-regulated. The one organization that has some say in the perfume industry, the International Fragrance Association (IFRA), cannot set new laws or force perfume companies to change their labels. While many health organizations hope to put more pressure on legislation, little change has actually occurred in the way of banning toxic chemicals and demanding more specific labels. Ditch your store-bought perfume bottle and make your own signature scent (6). To make a good perfume, you’ll need base notes, which will last up to five hours on your skin. Try cedarwood, cypress, ginger, patchouli, pine, sandalwood, vanilla, and vetiver. Next, your middle notes will determine what family your scent will belong too, whether its fruity, floral or woody. Good options include black pepper, cardamom, chamomile, cinnamon, clove, fir needle, jasmine, juniper, lemongrass, neroli, nutmeg, rose, rosewood, and ylang-ylang. Finally, you will need to choose a top note, which will be the first scent you smell after spraying your perfume. Common choices include mint, peppermint, lemon, lime, orange, bergamot. Equally divide 25 drops of base, middle and top notes essential oils. Add to your bottle and mix well. Adjust scent if needed. Screw on the lid and store your perfume in a cool, dry and dark place. The longer you let it sit untouched, the more the scent will mature and the better it will suit your skin.